According to a new tweet from the infamous @evleaks, the Moto G will be a cheaper Moto X, featuring almost the same specs as the Moto X, but will hit the market free on contract. The device supposedly features a Snapdragon S4 Pro processor clocked at 1.5GHz, an 8MP back-facing camera, a 4.7″ HD display, come in either 8GB or 16GB storage options, and feature an LG-made 1950mAh battery. So again, it’s pretty much an X, but with a minor downgrade in specs. Without knowing the full picture yet, it’s hard to separate the two devices completely. 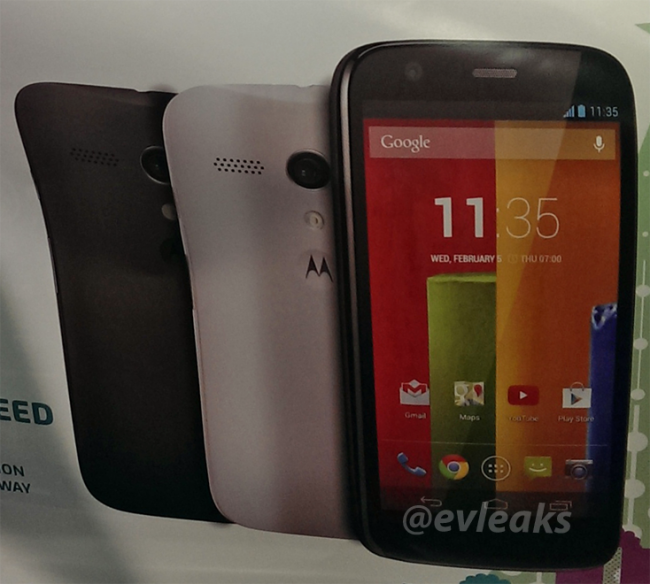 A picture was also posted alongside the tweet of an apparent press render for the Moto G, so this is our first real look at the device. In summary, it does look like a cheaper Moto X. Motorola may have an announcement coming soon, given that we saw the Moto G text pop up on their website earlier this week. We’ll keep you posted when more info becomes available.